January's Knitter of the Month is a joint prize to the Pearson brothers! They've impressed me with a mixture of stylish and sublime! 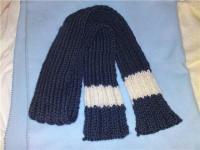 Ross cast on over 300sts onto circular needles (used as straight) to be able to work vertical stripes into his scarf. Owen knitted the first of many little jumpers for his Tour de France bunting from this pattern by Baa Ram Ewe. 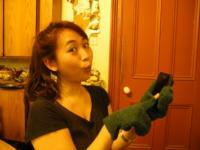 December 2013's Knitter of the Month is the fabulous (and slightly bonkers) Teresa! She's been knitting this since the summer and has made amazing progress. 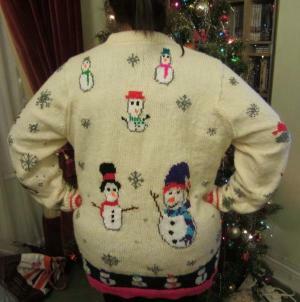 She designed the jumper herself and used knitters' graph paper to create the amazing festive motifs. I personally LOVE the story of the peguin's ski trip. Well done Teresa...you're a Christmas star! 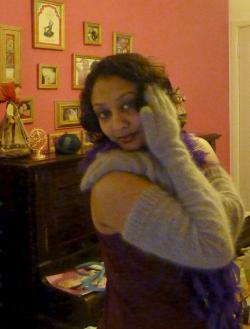 January 2013's Knitter of the Month is my very trying (she tried my patience that's for sure) sister Seeta! I'd like to stress that this isn't nepotism, she very much deserves her knitting-prize. Seeta isn't really a knitter (although she is after this project). 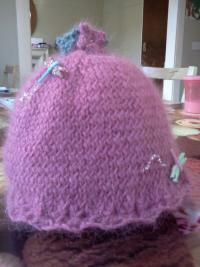 She could knit, but was a more creative knitter (remember the shower cap Seeta?) 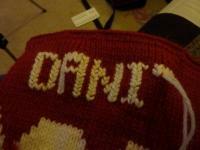 and insisted most of her knitting-knowledge came from having me as a sister rather than any actual believable reason. So when she told me she wanted to knit herself a cardigan my teachers' brain did ache just a little. And to make it trickier still she wanted cables, a tighter collar, a zip and extra long sleeves for her spaghetti arms...most of which I had to teach her over email...frazzled brains all around! I do have to give her full credit though. She's definitely more ambitious than I am and as you can see from the pics, has ended up with just what she wanted and a lot of new-knitting-skills! 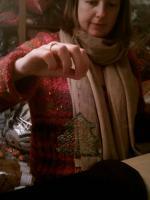 December 2012's Knitter of the Month is the very persuasive and dedicated Michelle! In early November Michelle emailed me as a self-confessed beginner with a pretty ambitious goal: Michelle and her boyfriend promised to make each other's Christmas presents. 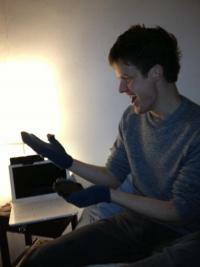 Michelle wanted a bedside table and Andrew wanted...a pair of mittens! Ok I think to myself, that's not too unrealistic if she's prepared to work hard...but they turned out to be not just any ordinary mittens. Michelle specifically wanted 'trigger' mittens (with a seperate fore finger) and the oh-so-modern design feature of having the option for open finger/thumb for easy use of his iphone! Phew...this was definitely a challenge for Michelle as a beginner knitter and me as a teacher. Usually I like to ease my students into projects that progress in difficulty as they progress in their learning but Michelle was so enthusiastic that with many warnings about homework, we dived into it. And I have to award Michelle Knitter of the Month for ultimate dedication and hard work as her mittens turned out perfect! 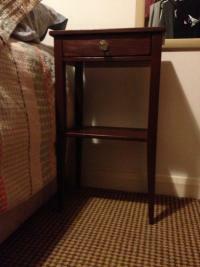 Here are a few photos...gloves and bedside table! 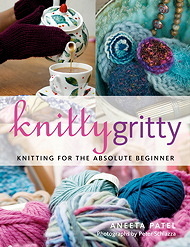 Sandra says, "Last week I finally managed to get my hands on a copy of Knitty Gritty: The Next Steps and then spent most of the weekend pouring over it cover to cover trying to decide which projects to do. I narrowed it down to the following: project 2: ladies' raglan jumper, project 3: men's bulky jumper, project 4: girls' pinafore dress, project 5: versatile kiddies' jumper, project 6: ladies' classic cardigan, project 7: gloves, project 9: socks and project 11: table mat and coaster set! The mountain of yarn has arrived! Now, which project should I start first..."
October's Knitter of the Month is Coreen from Scotland as nominated by her daughter Summer. "She has made these lovely blankets (with paw print patterns!) for the dogs & cats at Battersea Dogs & Cats home - http://www.battersea.org.uk/document.rm?id=848 - she used us lots of her stash and don't they look scandi-gorgeous! Almost too nice to send...but of course I will!!" September's Knitter of the Month is Suky. She came to me with fairly basic knitting skills but insisted she wanted to knit these slipper socks in the round for a gift for her cousiin who's about to start university. Top Marks to Suky! She really worked hard on these and I think they look ace. "I wanted to take up a new hobby and learn a new skill. I had thought about knitting before but never got round to it. Having spent my free time over the last few years studying or engaged in something academic, I really wanted to relax and do something creative. I love art but I’m not too good at drawing or painting. I have taken up pottery, which I enjoy very much, but I cannot imagine continuing with it once the course is over. A view she soon changed when I took her to Spitalfields market one day and she saw lots of young women knitting beautiful creations. Laura now wears my first piece of work – the scarf, and she has asked for a jumper next. 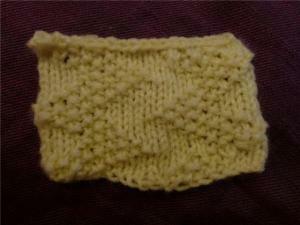 I have been asked to knit an ipod cover and a cover for my friends’ Kindle!!! What I would love is to have a little stall at music festivals – maybe I could make clay egg cups and knitted covers! I love the social aspect of a group of women creating things together. It is also a great way to relax and take your mind off any worries. Aneeta has been a great teacher – she made it seem effortless. I did not believe I would accomplish so much in such a short time. I even rang her when I was relaxing by the pool at a spa with my daughter, to get advice!" 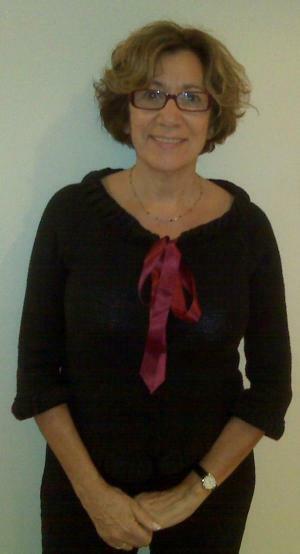 December's Knitter of the Month is Pepa from Tenerife! Pepa was in London for the month of August when she came to one knitting class, SOS and had lunch with me one day to show off her progress...and what great progress she'd made in a short time and with the help of my book Knitty Gritty : ) She's been clacking away with lovely things for herself and gifts; and when I caught up with her during my Summer in Winter holiday in December she definitely proved her Knitter of the Month status. An enthusiastic lover of life and one of the most generous souls I've ever met. 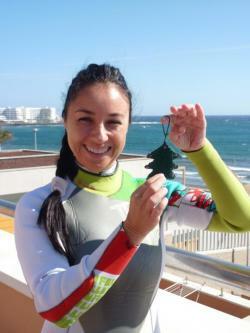 Here she is with her knitted Christmas tree ready in her wet suit about to go kite surfing...truely a renaissance woman! July's Knitter of the Month is my Father. Not a prolific knitter himself (although he did test the workshops for learning to knit in my first book), he was a great supporter of the craft and gave the world of knitting ME! He died on 27th June 2011 and his loss will be felt by his family and friends forever. He was the wisest, kindest and jolliest man ever. My fondest memories in a lifetime of a million fond memories are of him happily eating all the horrid things I brought home from Home Ec class, taking me on his shoulders to buy me Enid Blyton books when I was very little, and the immediate change of tone of voice when he realised it was me on the phone. In this photo he shows his amazing sense of humour and tolerance for anything his daughters throw at him - he's wearing a piece of loopy knitting my sister was working on. 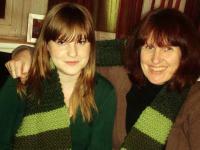 June's Knitter of the Month is a joint award to Summer and Hayley (Sumley as they are known in the tabloid world). Summer started the labour of love to knit a chess set for a friend and dragged Hayley into the dark side with her....not without a LOT of complaining that is. In the end I just couldn't resist their heartfelt application letter! 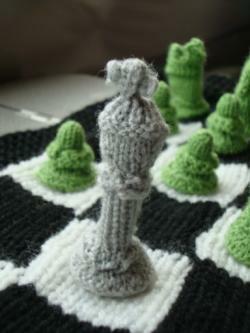 The pattern for this amazing chess set is available free from Clare Scope-Farrell. May's Knitter of the Month is Jonathan and his amazing technicoloured jumper...with a twist on a Catholic theme. "It's the immaculate heart of Mary, and it's knitted in Rowan Cashsoft DK. And the photo shows the Blessed John Paul II in St Peter's Square, Rome." 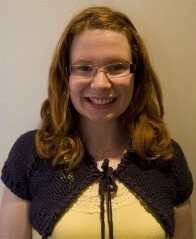 April's Knitter of the Month is Sarah. Not only has she been knitting up a storm testing a cardigan pattern for my new book (look out for it in Knitty Gritty 2 due out in Aug 2012) but she also knits for her son. Sarah - here's the photo to bribe him with when he's a teenager! February's Knitter of the Month is a quick nod to ME! I've been working like a (knitting) trojan on my second book and with my allergies on high-gear this hasn't been an easy ride. The rule is that the more natural a fibre I'm knitting with the worse I am with sneezes, sniffles and sore eyes. But after the trantrum that was January, I've made it through and at the last count, I would say I'm 69.5% of the way through this monster project. Yay me! : ) And Yay to my air purifer! January's Knitter of the Month is the shining star that is Amelia. Amelia knitted this entire jumper for her boyfriend before realising that she knitted it all TBL - through the back of the loop. 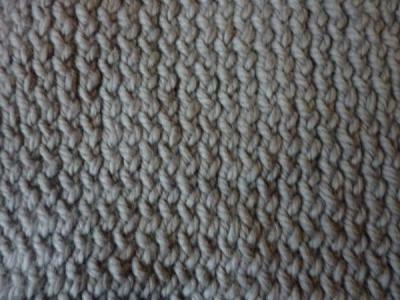 Apart from this making every stitch harder to pick up, it also twisted the stitches creating an uneven look to the fabric of the knitting. Althouh the size and shape of the jumper is fine, the technique is incorrect and doesn't give the smooth finish to the knitted fabric that you see in stocking stitch. Amelia's decided that she want to perfect her knitting technique and is going to reknit the entire jumper...this time knitting each stitch through the front of the loop as it should be. I think she'll find this sooo useful to learn and find the process much easier as the stitches won't be twisted and will be easier to work. You can see in the close up above that the stitches are twisted. I don’t often take on commission knitting jobs as they are never really worth the amount of time they take in terms of the cost I would have to charge – this is especially true at the moment as my time is so fully occupied with writing my second book. However when I read this email from ‘North London Mum’ as she called herself, it really struck a cord and I couldn’t help asking for more information. 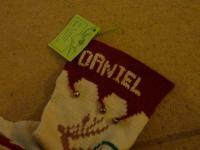 “My mother was a champion knitter and made dozens of personalized Christmas stockings (with first and middle names knit into the top), for her children, their spouses, her grandchildren, nieces, nephews, *their* spouses and children, etc. 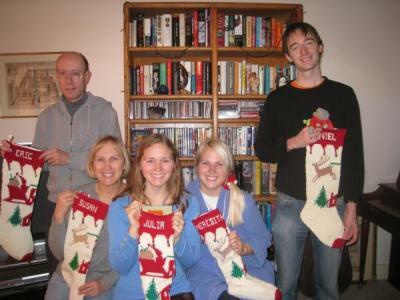 Before she died she knit each of her grandchildren an extra stocking, in a matching pattern, to be used for the grandchild's future spouse. 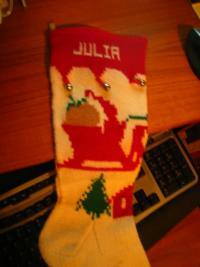 My daughter just married and I would like to add her husband's name to the top of the stocking my mother knit for him in 1994. But embroidery looks naff, at least when I do it. I tried but then took it all out.” HELP! 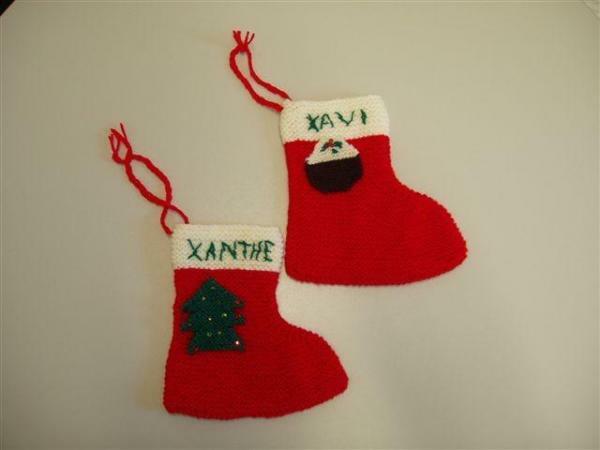 My initial reaction was what an amazing thing for her Mother to have knitted stockings for her potential grand children in law! I couldn’t resist taking on this job as my little way of carrying on Thelma’s work. It was an honour and reminded me just how much I love knitting and the stories it brings my way. The next part of the story may make you well up as it did me. I have to say I was a little nervous getting started on this. Technically it’s not difficult, just a little piece of Swiss Darning, but just taking on my small part in Thelma’s story made me realise, especially in the run-up to Christmas which sometimes feels so commercialised, that something handmade with love can be so powerful. 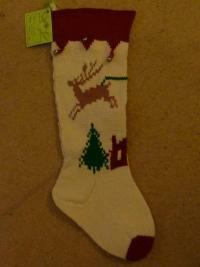 Thelma’s stockings will make Thelma a part of her family’s Christmases for years and years to come. I can't believe how beautiful it looks--and this wasn't even in your specialty of knitting. It really is amazing. I can't thank you enough. If I squint my eyes a bit it looks like Mom herself knit in the name. Very best wishes to you for a splendid 2011. October's Knitter of the Month is Alexis. After a slow start (with a bit of telling off from the Head Mistress! 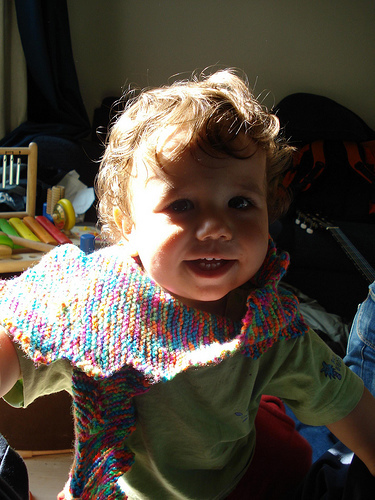 ), Alexis is zooming along with his knitting and about to take it on a trip to South America. Mmm...maybe he'll come home with some beautiful alpaca yarn... Here he is with his scarf in true football pose! September's Knitter of the Month is Sara with her SOS'd hat. pattern which has me flummoxed - I don't know any other knitters to ask. other stitches come off the needle and sort of hang on the first?" A: "Lifting a stitch over is like casting it off. So in this case, you lift over 4 sts over the top st on your right hand needle. You'll turn 5sts into 1st. Let me know if that makes sense." Q: "(p1, yon, kt tbl) into next st."
A: "This is a bit of a tricky way of putting it. I would guess it means p1 (but don't release the stitch from the left hand needle), yon (wrap the yarn around the right hand needle anti-clockwise), then knit into the back of the loop of the stitch you initially purled into, releasing that stitch when you've knitted into the back of it. It's a bit of an educated guess as it doesn't look like any instruction I've seen..but hopefully it'll work. What's amazing is that no matter how much knitting I think I know..there's always a more obscure or odder way to explain something!" Clare needed an SOS as the cardigan was turning out too small. So we invented ingenious panels that ran along the seams of the body. Now it's a perfect fit! 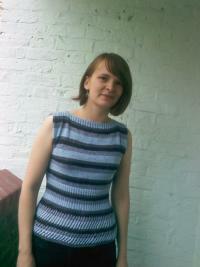 July's Knitter of the Month is the lovely Helen. She's been bringing her knitting (and cakes and brownies) to SOS for the past few months, and I'll admit I never quite knew how this top would turn out as the photo on the pattern wasn't very clear. But I was very pleased and impressed by Helen at August's SOS. Not only for the yummy brownies ; ) but her beautiful and stylish Summer knitting! Absolutely gorgeous!! What's next Helen? June - oops, missed a month..send more pics please! 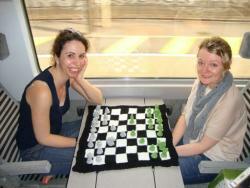 May's Knitter of the Month is Cet (see January 2010). She's impressed me enough to win twice! You only need to have a look at the pic of her and Mr Cet to see my point. WOW! 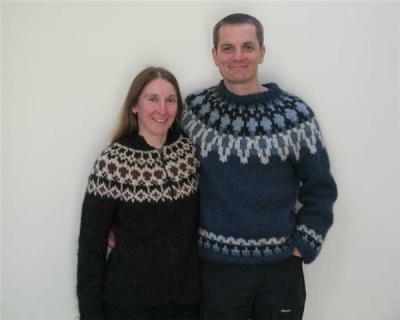 "...I've managed to get Ross out of the garage and in front of the camera..here you go..Icelandic jumpers!!! The yarn is really beautiful Alafoss Lopi rom www.carregyarns.com and Ross's came in a kit with the pattern. 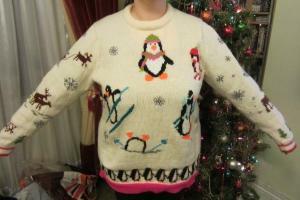 Mine had a really scary part where it had to be cut open to put the zip in, as it was all knitted in the round on circular needles. I took my time with that part (and didn't havea drink until afterwards!!) and it all went ok. Whew! I actually knitted mine twice coz I didn't checkmy tension and when I got to about 90% done (including the colour changed in the yoke) I decided it was going to be too small. So I undid it all, worked out that I needed bigger needles to make it right and did it all again with the next size up!!! I kept thinking about you saying that you get more value out of the yarn when you have to do that! And it's a perfect fit now! :-)..."
April's Knitter of the Month is Summer's 'It'll Go With Everything' cardigan. A real journery of a project..and that's just the sending of the left front to Scotland to be SOS-ed by Summer's Mum when a needle size slip up threatened the completion of this pretty cardy. Worth all the trouble I reckon! 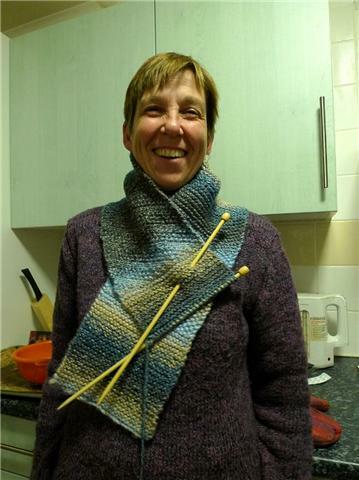 March's Knitter of the Month is the very patient Sybil. 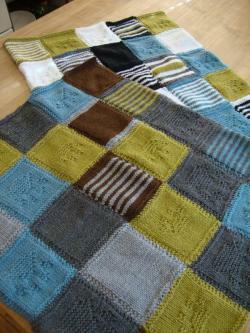 You can see what a labour of love this afghan was - panels of cables and moss stitch that she designed herself. 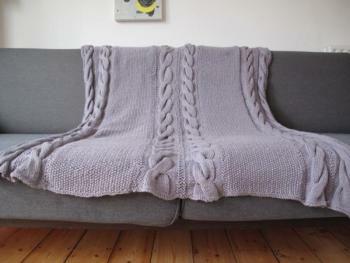 I wish her many cosy nights knitting in front of the telly snuggled under this beautiful blanket. I was asked to do a rush commision job for an elegant pair of opera gloves. 4-ply yarn, arm length and yarn that made my eyes stream! I don't often take on commissions, but this one was 'an offer I couldn't refuse' and I think I deserve Knitter of the Month! January's Knitter of the Month is Cet. She's been sending pics of her knitting for a while now, and I think this 'hybrid' from Knitty Gritty is worthy of the first KotM of 2010. "Here's a pic of the hybrid lacy shawl and girly scarf!!! 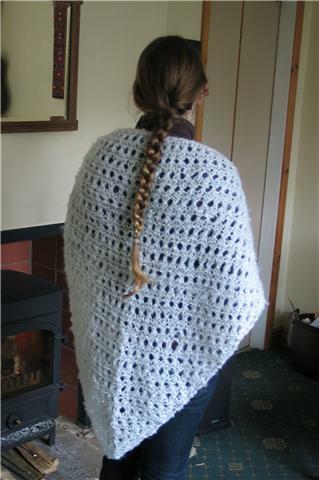 I did the lacy shawl pattern but with bigger needles and mohair, like the girly scarf. It's for my Mom and has come out nice and generous to keep her cozy on chilly evenings!! 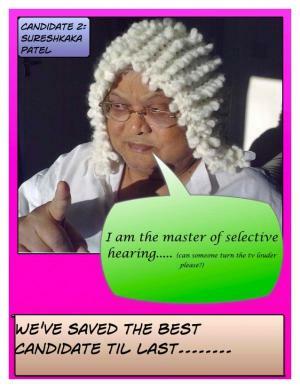 *Mainly thanks though to Aneeta's superb teaching skills. But is there any QUICK way of sewing on sequins???" November's Knitter of the Month is Caroline from the Tower Hamlets Wheelers (London's bestest cycling group)! She came along to a class claiming to be a beginner but was soon impressing us all with her swift grasp of stitch combinations. She took her knitting along on a train/cycle holiday to Copenhagen and comes back with her own take on Moss Zig Zag (see October's winner) - here's Caroline's pretty scarf and clever Moss Zig! And Caroline has considerately sent me her pattern for Moss Zig so we can all have a go. 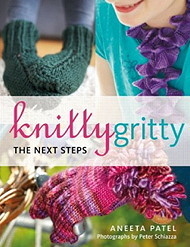 September's Knitter of the Month is possibly Knitty Gritty's biggest fan Linda! Just wanted to say how much I love your book. Decided to go back to knitting after about 17 years of not going near it and picked up your book as I thought after a break of that long I needed a good beginners guide. Your book is the best ever and has got back addicted to knitting as you can see from attached photos. My favourite project to make so far was the shawl (closely followed by the project bag). Least favourite was the girlie scarf as the yarn was a nightmare to knit with, especially when I discovered all the knots in the middle of the yarn! *Note from Aneeta* Remember that mohair yarn is tricky to knit with, but it's so fluffy that you'll never see a mistake..a very forgiving yarn! Planning to do more bags and make a tie, even if it is just to use up some of the yarn I now have. Would recommend your book to anyone. Even my mother thought it was great and she's been knitting for about 50 years. She also made a shawl as a present for a friend. Please, please say you're bringing out a sequel to the book. I definately would pre-order it as I know the patterns would be fab! August's Knitter of the Month is the lovely Diana. A New Yorker living in London, she's been delighting, amusing, teasing and looking after me in our weekly one to one knitting sessions since the Spring. Diana was a school teacher for many years and I think she's enjoying getting her own back by playing the cheeky student! She's come on in leaps and bounds with her knitting - and has just finished 'Rowena' from Knit Two Together. 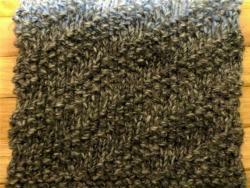 This is one of my favourite patterns from one of my favourite books knitted by one of my favourite knitters! 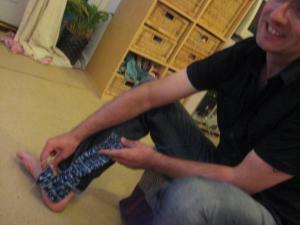 July's Knitter of the Month is Seb - the first person I ever taught how to knit (now you know who to blame/thank!) Seb has long moved on from the days when the two of us used to curl up on the sofas in front of Lord of the Rings Extended Version, knitting endless granny-squares to being a very accomplished knitter. If you've ever seen me cycling through London in the winter wearing a beautiful, lilac shawl - he made it for me! Just to show that I still have something to teach him, here's a photo of Seb's Blue, Eye-Matching, Sock. Different sofas, same film, 6 years on! 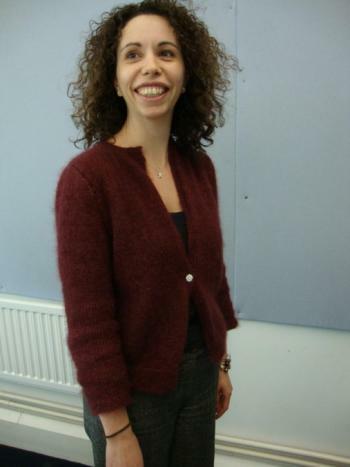 June's Knitter of the Month is Antonia - I hope that once you get knitting, you can all be as inspirational as she is! "You might like to know that a couple of colleagues who knitted in the past have taken it up again having seen me knitting, and another colleague who hadn't knitted before asked me to show her how! I recommended your book, which she bought and now regularly brings to work when she joins me for pre-workday knitting sessions!" 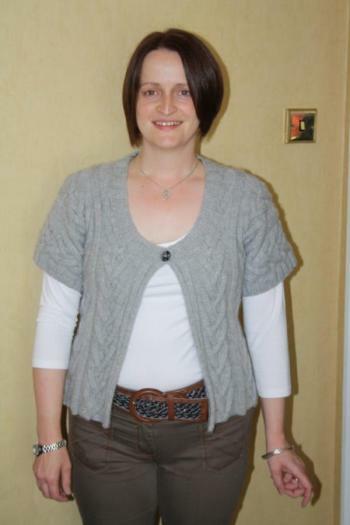 May's Knitter of the Month is Tori from Devon. 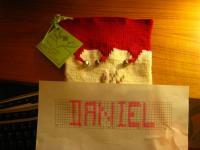 She's been steadily working her way through Knitty Gritty and sending me photos of her interpretations of my patterns. 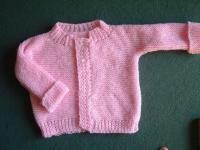 "This cardigan was made for my friend's little girl Emily. I was shown how to knit and purl when I was a child but that was it. 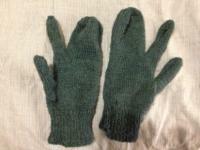 I have been knitting now - thanks to Aneeta ('s book Knitty Gritty) - for 6 months. Her book is absolutely brilliant and I would not have been able to get this far without it. I can now increase, decrease and follow a pattern and has given me confidence to tackle a jumper for myself. There is no stopping me now..."
Sorry about the lack of knitter of the month since February...I'm a little low on inspiration. So please send photos and knitting stories...I need to get my knitting-mojo going again! 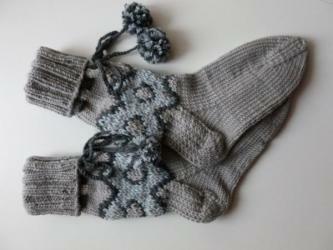 Feb's Knitter of the Month is Niki and her instant sock obsession! Niki lives in my basement...ok...it's the downstairs flat, but I like to think of it as my basement She's a very creative lady who makes all sorts of imaginative and beautiful gifts for all her lucky friends. And now they are getting socks! 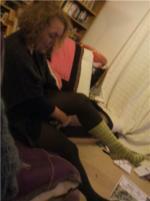 After a taste of my sock-addiction over a neighbourly dinner, Niki instantly got the bug. And I'm very proud of her, as apart from a couple of boozy, late night Knitting SOS's, she managed to knit most of her first sock all by herself (guinea-pigging my sock pattern at the same time)...very impressive! 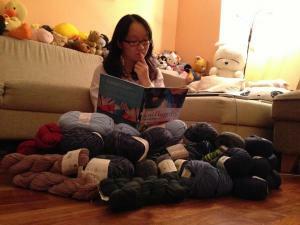 I think her prize must be more sock-inspiring yarn...! January's Knitter of the Month is Gladys from Brazil! Gladys has been in touch with me for several months and wanted to take some knitting classes whilst she visited her daughter for a few weeks this month in London. I was surprised and flattered that someone from so far would have heard of Knitting SOS; so I happily agreed to some private classes. Gladys is a very creative lady. She makes beautiful sewn dolls clothed in pretty Liberty prints and finished to an extremely high standard. She can knit, but like so many knitters, was baffled by the sometimes incomprehensible language of 'knit.' Believe me...Brazilian Portuguese can be simpler! Her wish was to learn to read knitting patterns so that she could add knitted toys to her repertoire, and knit clothes for her lady-dolls. Luckily for me, not only was Gladys a good knitter, but also she somehow knitted English style (most South Americans knit Continental style due to the Spanish influence). She was also a really quick learner - sometimes teaching me the Brazilian word for knitting terms as we translated patterns! All Gladys's hard work paid off. She really learned to understand and read knitting patterns...as our new friend 'Curzon' proves. Prize: 2 skeins of Colinette Cadenza (cleverly hand painted, super soft yarn). December's Knitter of the Month is Rachel M-T. Rachel's been knitting for years and came along to my Knitted Wire Jewellery course and my WI session for Christmas decorations. She took away all the info from those classes, brewed them up, and came up with....knitted wire Christmas decorations! I have to admit that I'm pretty impressed. Not only did Rachel invent the patterns herself, but she's the tidiest wire knitter I've ever seen. I'm not a big fan of perfectionists, but she certainly makes a good case for them! Only one complaint...Rachel didn't write down the pattern for her shimmery wire Christmas tree, and I want it! I'm going to have to convince her to make another so we can all learn them next year. Prize: Sock yarn and needles. Apologies for the dreadful photos...all my fault. Photo (of orthopedic shoes and knitting) coming soon. November's Knitter of the Month is Charlie Tyfield (nee Kitchen). She got married in October, went for a 1 week honeymoon, then straight home to a horrid, double foot operation! A busy lady, Charlie often has to put knitting aside in favour of 12 hour work days, so she used her recuperation time wisely to finish a few of her ongoing knitting projects. Amongst them are: a shrug, a hat and Christmas decorations! This month's winner is Harriot Lane Fox who wrote that lovely article about me in the Sunday Telegraph. 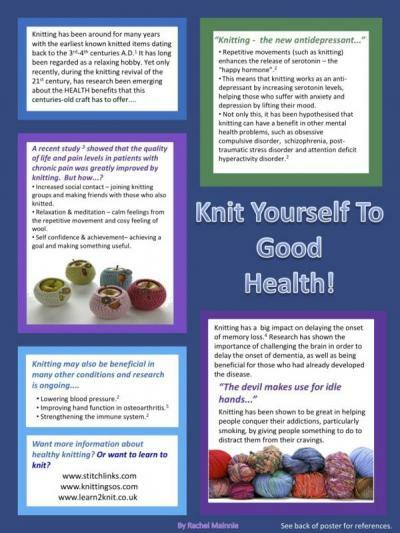 See the Press page for the link to the article, and Harriot's knitting journey so far. I just want to say...she didn't write the article so I'd make her KofM...this is just my way of saying, thank you for saying nice things about me! That always deserves a reward! Also, her enthusiasm as a new-ish knitter spills out throughout her article to hopefully inspire lots more people to pick up knitting needles. 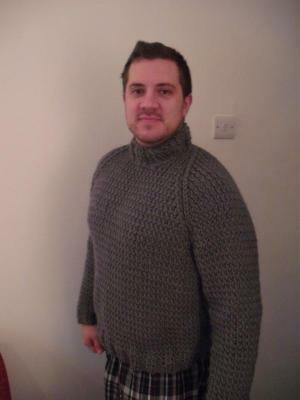 This month's Knitter of the Month is Alex McLean from south London. Alex knits once a year after seeing me at Dork Camp (long story, http://dorkbotlondon.org/wiki/index.php/DorkCamp08 ). 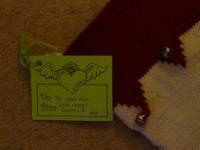 Last year he knitted a pair of booties for his soon to be born son. 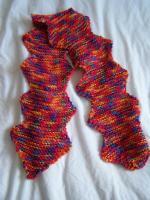 And this year he started Project 4 from Knitty Gritty - the Zig Zag Scarf. After knitting one zig with me, he completed the rest of the scarf all by himself - which is quite impressive for someone who's only had two knitting classes. Prize: 'some yarn to match my Missus's eye's please' was Alex's request. So I found a lovely hand painted chocolate yarn as his prize. Manos del Uruguay yarn in colour 2235. Knitting SOS's first Knitter of the Month! Kylie Archer, 28, from Sydney, Australia. Prize: a skein of HipKnit's fabulour hand dyed superwash merino DK.